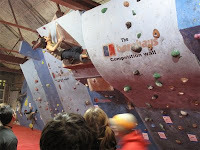 The last round of the Berghaus (& Sheffield Walls) Bouldering League is currently going on as I write this, with around 80 competitors taking on Sam's and Percy's creations. As usual we've got the £50 cash problem on offer (2 in fact, 1 Men & 1 Women's) but far from usual is the fact that the Men's got done in super fast time. Jordan Buys fresh from Burbage South dispatched the problem 2nd go with a fine display of volume / fridge hugging. As you can see below Percy was only too happy to hand out the £50.